With the Mini O HD Wi-Fi camera, you can see what's happening at home no matter where you are. 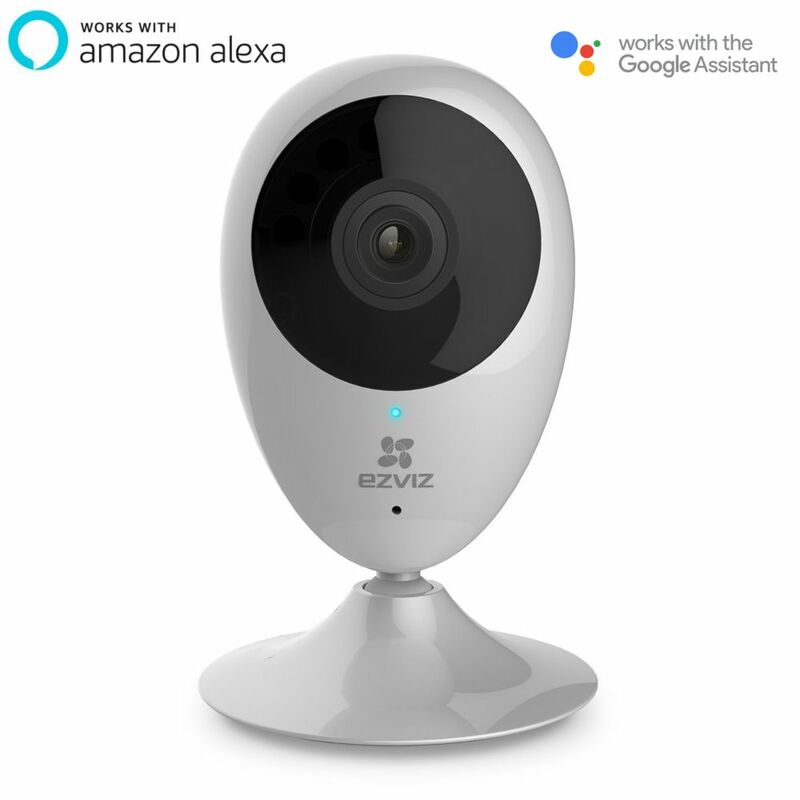 Check on your baby, children and pets anywhere you have Internet using the EZVIZ app. The app also alerts you whenever the camera detects motion, such as when a pet gets into the trash. If they do, you can use the built-in speaker and mic to tell them to stop. Monitor what's important at night. The Mini O provides added security by automatically switching to night vision mode for clear HD video when its dark. Enjoy a free one-month cloud storage trial with seven-day playback for each purchase of an EZVIZ Wi-Fi camera. The Canon imagePROGRAF iPF670 24-inch large format printer is an affordable model for entry-level users. The iPF670 is the printer for your poster and signage needs. The optimal color profile and latest magenta ink will create the vivid and impactful image you need. Canon understands speed is important, that is why the iPF670 printer is capable of producing an A1 (23.4 inch x 33.1 inch) print in up to 28 seconds using Economy Mode! The included Sub-ink tank system allows you to use all of the ink in the tank before replacing it, as well as replacing an empty ink tank on-the-fly without stopping a job mid-print and sacrificing print quality. The iPF670 printer is available as a desktop model or with stand and basket. From a so ft.ware perspective, the iPF670 printer comes loaded with user-friendly so ft.ware solutions ready to meet your printing needs. With its own 16GB of internal memory, Canon's VIXIA HF R80 Camcorder is ready to roll and record 1080p HD footage out-of-the-box. Whether you're recording home videos, events, or recitals, the 57x Advanced Zoom ensures that you can get the shot from the back rows of an auditorium if need be while the Super Range O.I.S. (Optical Image Stabilization) keeps the image steady at longer focal lengths. HD videos are recorded to the internal memory, or to separately available SD cards in the MP4 format for easy playback on most devices. The Homeguard 1080P Full HD Smartcam with Temperature & Humidity Alarm is an advanced security product that turns your PC, Smartphone or Tablet into an enhanced home monitoring system, allowing you to view live footage, set temperature & humidity alerts, speak to your family all using your connected Smart device. Gives you a ultra wide angled, 120 view of your room to ensure your home and family members are safe and secure at all times. With its integrated Temperature & Humidity sensor you can set it to alert you if your room gets too hot or cold, and it also works through the night providing hi-resolution images and video even in complete darkness thanks to its built in infrared night vision capability. To give you complete peace of mind there is a handy 2 way audio feature that lets you speak and listen through the camera using your PC, Smartphone or Tablet. Protect your 1-2 bedroom home or small retail location with an HD surveillance camera system from Q-See, including a 8-channel HD DVR, 4 720p cameras, and a pre-installed 1TB Purple Surveillance Storage drive from Western Digital. View cameras and recordings anytime right from your smartphone, tablet, or computer with Q-Sees remote connection feature and always know your property is safe. These HD cameras are weather-resistant and perfect for indoor or outdoor use, and the metal housing and mount design protect against tampering and vandalism. Built-in LEDs allow you to see up to 100 feet in complete darkness, delivering protection and peace of mindday or night. Mini O CloudCam Indoor 720p Wi-Fi Security Camera with Intercom With the Mini O HD Wi-Fi camera, you can see what's happening at home no matter where you are. Check on your baby, children and pets anywhere you have Internet using the EZVIZ app. The app also alerts you whenever the camera detects motion, such as when a pet gets into the trash. If they do, you can use the built-in speaker and mic to tell them to stop. Monitor what's important at night. The Mini O provides added security by automatically switching to night vision mode for clear HD video when its dark. Enjoy a free one-month cloud storage trial with seven-day playback for each purchase of an EZVIZ Wi-Fi camera. Mini O CloudCam Indoor 720p Wi-Fi Security Camera with Intercom is rated 4.4 out of 5 by 583. Rated 4 out of 5 by kuroi from Great Quality, but system should improve more The product does the job done. I like the Desktop and Mobile Applications. Only system should improve a little more. Example would be: 1.) Able to change network IP address to static 2.) Download Clips rather than Recording again the recorded video to export the file *Don't know if storage will save more recordings on the current setup. Though saves on bandwidth on the selected minutes that needs exporting. But what if you want to export 3 hours of the Recording? Rated 1 out of 5 by Binkiebeau from WIFI connection Tried multilple times to connect to WIFI but no success. Why make it so difficult. Given up now. Rated 3 out of 5 by mjmcq from Good Camera but wants too many Permissions. A good camera, clear picture etc but i'm not sure why its needs so many permissions to work. Why does it need access to my calls? Rated 5 out of 5 by Gena from Great item I have been researching for months. I purchased other brands but I wasn't happy. I came upon these and love that they have 3 mounting options, micro SD storage, ( I won't pay cloud fee for 4 cameras), they have micro positioning once mounted because they swivel, small and discreet, easy to set up, 2 way audio so I can tell the dog to get off the couch. The clarity of the video is great even for the 720 which I have 2 of as well as 2 of the 1080. The app is easy and shows all my cameras at once and I can tap each one for individual past and present viewing. I seriously can't think of anything negative to say. I love them which is why I purchased 2 more. You can't find a better security camera with all these features and at an affordable price. As you can see from my pictures the clarity is really clear. I don't see the bright light at night as it shows in the mirror. My one dog moved which alerted the camera to record. The room is about 20 feet then the hallway. Just so you can see how far it picks up items. Rated 4 out of 5 by Jerome from Mr I have no trouble doing the setup for the first time. Video is better(clearer). Design is better(I think). The power connector is intact behind the camera. My old cam power slot is in plainly located at the left side that cause to loose power when accidentally bump. WiFi capability is better too. It can connect to my router at home even it is beyond the street and a few houses. Used it day and a night continuously once and doesn't heat too much. Even I disable the encryption I can't still play the mp4 file save on the SD card so I can't review it in my pc using other mp4 player. EZVIZ Studio is a disappointment. It should function or better than the mobile app. The best part is I got it less than 37USD excluding the 128gb sdcard. My old cam is almost 50USD. I love the long USB power cable. It seems my network can't handle Ultra HD streaming but I can view the recordings in the gallery. Hi, can someone from EZVIZ tell me if SEEZV00001 Part Number: CV-206, is the same as HSEZMINO? If not, what is the difference? As far as I can tell, it is the exact same Mini O Camera. Please reply as I'm about to make a purchase. Thanks. Is this camera compatible with cloud storage through WIFI? Can we use it for outdoor? Can this be used as just a camera, not hooked up to internet and record to a SD card only?